Remember that your soul is a temple of the living God. The kingdom of God is within you. Night and day let your aim be to remain in simplicity and gentleness, calmness and serenity so that you will find your joy in the Lord Jesus. Love silence and solitude even when in the midst of a crowd or when caught up in your work. Physical solitude is a good thing, provided that it is backed up by prayer. But far better than this is solitude of the heart, the interior desert in which your spirit can become immersed in God. Paul Francis Daneii was born near Genoa, Italy on January 3, 1694 to parents who were exemplary Catholics. His earliest education was from a priest in Lombardy. He was an exceptional student as well as being virtuous and prayerful. Daneii, in addition to academic excellence, spent much time in adoration before the Blessed Sacrament. At age fifteen, he left school, returned home and was beset by many trials. He renounced marriage and an inheritance, but kept the breviary of his uncle, a priest who had died. Daneii dreamed of forming a religious order that honored the Passion of our Lord. Eventually he drew up the Rules of a new congregation according to a vision he had had to form what would become the Congregation of the Passion, referred to as the Passionists. In 1747 he was elected to be its first superior general. He held this office until his death in 1775. Paul was a model to the members of his community. Burning with the desire for the salvation of souls he continued to preach the word of God. Sacred missions were instituted and numerous conversions were made through his intercession. Paul’s first biographer, St. Vincent Strambi, writing only eleven years after his death argued that the Holy Spirit raised up Paul of the Cross to help people find God in their hearts. Receive with a sheet from you the devout expressions that you were so kind to send to me and for our congregation that God impress it more in your heart and open the way to a universal enlargement of the same as we really hope regarding the possibility to found in an institution. Also monasteries of women although there are some persons that have about this a special feeling. I and some of the benefactors that have shown in the intention of contributing to the foundation, we cannot at a moment speak of this. If God doesn’t send us more light to let us know his divine wish we leave everything in his hands of the Divine Providence that he will do the best. Please excuse me if I didn’t reply to you earlier but this was due to my engagements with the missions and many other businesses that keep me busy and overwhelmed. Please recommend me to God in his sacred wound. I leave you with great esteem. 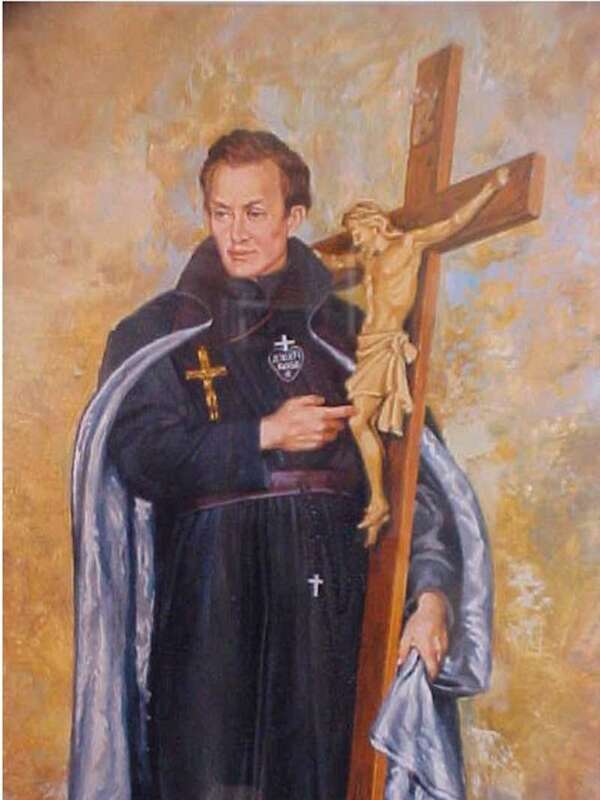 Paul of the Cross was the founder of the Passionist order. 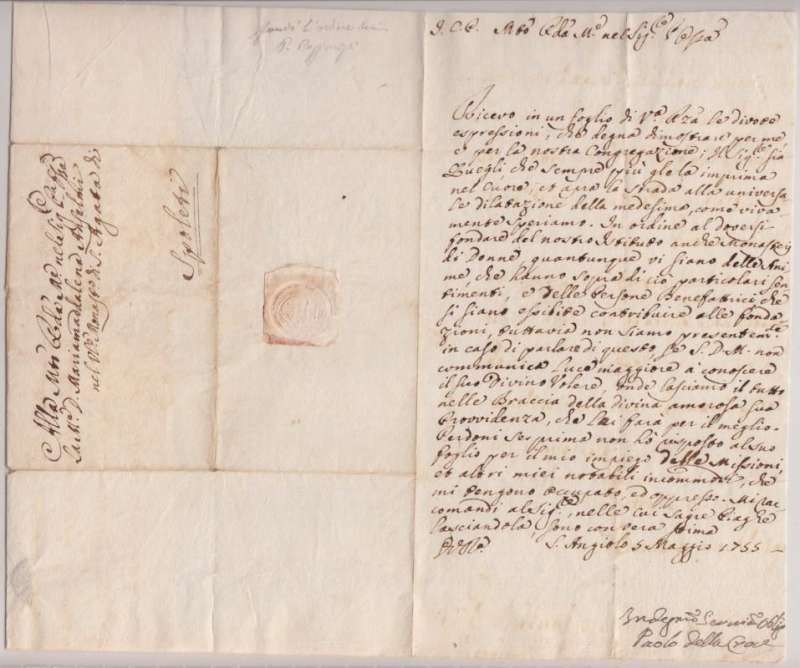 This is a letter signed by St. Paul of the Cross on May 5, 1755. The following information regarding this letter was obtained from Laurence M. Finn, C.P., President of the Passionist Asia Pacific Configuration, headquartered in Seoul, Republic of Korea. He has been working on the letters of Saint Paul of the Cross for over twenty years and was fascinated to find this one on Papal Artifacts. 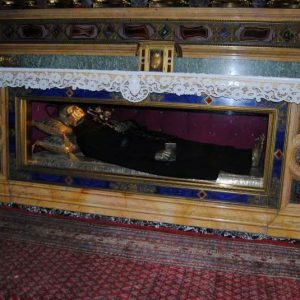 (The letter) is addressed to Mother Mariamadelena Anselmi–a holy old Benedictine nun who played a part in the foundation of the Passionist Nuns along with our Founder. When the community was eventually founded in 1773, she considered herself too old to make the move. One of the nuns in her community did make the move and was the first professed Passionist Nun. You will find three or four letters addressed to her by Paul. They carried on a correspondence for over twenty years–and all that remain are four letters. The seal shown on the letter was also of interest because they are usually sealed with red wax and marked with the General’s personal seal. This letter seems to be in a slightly different format. On the address portion of the letter (they didn’t use envelopes in the 18th century) Paul had written “Spoleto”, which is a bit of surprise. She should have been in residence in Vetralla at that time-but she must have moved around a bit. All of his letters go together to create the fabric of history that belongs to the Passionist order and their founder. We are grateful to Laurence M. Finn for this information with which he has provided us. He saw the Passion as being the most overwhelming sign of God’s love for us and at the same time our best means for union with Him. 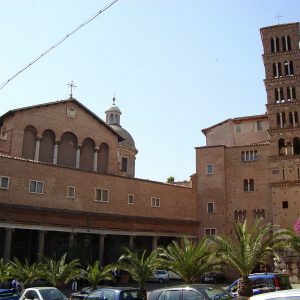 Inspired by the Passion and led by God, St. Paul preached throughout Italy. Along with his preaching vocation he was also inspired by God to found the Passionist order. It took many years of toil, sacrifice and suffering before Paul was able to found the order of priests and, later, nuns, devoted to the Passion of Jesus Christ. Paul spent many hours in prayer and adoration before Jesus crucified. While traveling he carried a large wooden crucifix in honor of our Lord’s Passion. It was for this reason he came to be known as Paul of the Cross. His two greatest characteristics were his fervent devotion to the Passion and the extraordinary sacrifices and penance made for the conversion of sinners. He continually made sacrifices and did penance and endured mortifications for the success of his preaching missions and for the needs of those he tried to convert. One such mortification was traveling barefoot in all his travels throughout Italy. Extraordinary miracles through Paul’s intercession and prayers occurred. It was apparent to all that God was with him in a most remarkable way. Like the Apostles, immense crowds gathered and followed him. His great love for God and for Mary radiated to the crowds and caused countless conversions everywhere he went. His austere manner of life encouraged the people to make reparation to God for their own sins. Paul said, Let your hearts be full of compassion for the poor, and lovingly assist them, because the name of Jesus is engravened on their countenance. When you have not the means of helping your neighbor, recommend him fervently to God, Whose sovereign dominion holds all creatures in His hand. Counsels gently given heal every wound, but given with sharpness serve to aggravate tenfold. Be gentle in your actions; speak with a peaceful mind and in a calm tone, and you will succeed better. Poverty is good, but charity is better. 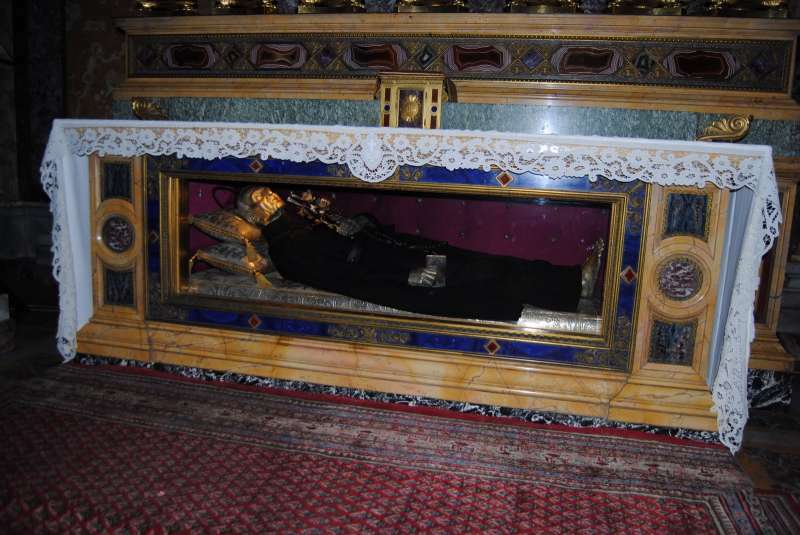 The body of St. Paul lies in the Basilica of Saints John and Paul in Rome. Pope Pius IX beatified him on October 1st, 1852, and canonized him on June 29th, 1867. His feast occurs on October 20th in the United States. There are several biographies of the life of Paul of the Cross, among them, As a Seal Upon Your Heart by Paul Francis Webster, 1994. Information about St Paul of the Cross that is included in this biography may be obtained at www.saintpaulofthecross.com. Papal Artifacts gratefully acknowledges their generosity in the use of this biographical information. 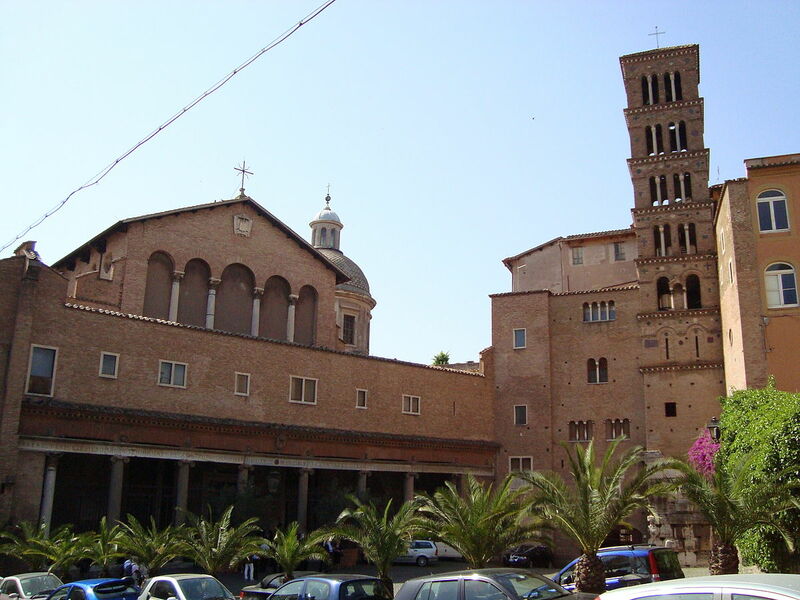 About the YouTube: Saint Paul of the Cross is buried in this church in Rome, and beneath it is the subject of this Rome Reports video. Saint Paul of the Cross, pray for us!